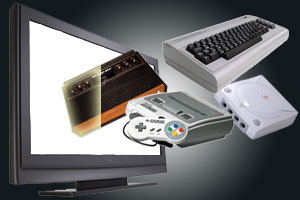 This is our guide to the often confusing world of emulation. When working well they can open your PC up to the near limitless world of retro gaming, but when they aren't there's little more frustrating especially when it's getting in the way of that one game you'd just love to resurrect. 1) The correct emulator for the machine you want to emulate. You can find this information on the page for the computer or console your after in the Machines section of this site. 2) A copy of the game you want to play in a format that the PC can understand. Obviously you can't put a game cartridge or cassette in your PC (well not easily) so you need an "image file" which contains the information found in the cartridge, disk or cassette. If you're want to play console cartridges these files are known as ROMs. The others tend to be called simply disk or tape images. They can be downloaded from various places some of the legal ones are listed around this site but a good place to start looking is Google. 3) Some emulators require a further ROM file which contains the information stored in the original console or computer's BIOS chip. These too can be found by searching Google, the readme file for the emulator you're using will tell you if you need one and if so the file name to look for. Emulators - Good or Evil? If you want to play the classic games in the Game-Star Heroes section, unless you've got money to burn your going to need an emulator. These programs make your PC act like whatever computer or console you need it to in order to run the games you want. There is no doubt that they are wonderful programs and most of them very professionally finished but they live in a dubious world legally speaking. Downloading and owning an emulator is not illegal however downloading a game ROM is, it breaches international intellectual property laws (copyright) and is just as illegal as downloading copyrighted MP3s. But downloading an old game that will never again be available to buy new is very different to downloading a music recording that will probably be always available on one format or another. The games companies hate emulators because they give people a free ride. They've spent lots of money developing these games and we are stealing from them by playing these game for free. The counter argument for that is that we can't buy these games anymore, they no longer sell them and so we don't get the opportunity to pay for them. The companies then fight back saying that they do still sell them in retro packs such as the Atari Anniversary pack. They argue that these packs do not sell well thus proving that the public aren't willing to pay for old games which is why they don't sell them. Well of course we aren't willing to pay £20+ for 5 or 6 old games why would we? That's terrible value for money, sell us 50 for £10 and we'd do it. It comes down to greed the games companies have already made their money on these games on initial release then again on budget, do they need what adds up to the budget price again for games going on 15 years old? The games companies know this, they know their arguments are thin because they keep piling more arguments on top getting thinner as they go. Some companies argue that emulating old games devalues the characters that are still around. This is really clutching at straws, I can't believe that they genuinely think that people wont buy Mario Sunshine on the Gamecube because they already have Mario World for the SNES running on an emulator. I never had Mario when I was young, I started playing it recently on an emulator and now I'm hooked and I'll be first in the queue when Sunshine is released. This is what emulators can do for the companies, they should think of them as being like the free demos they give away on magazines. With the cd based consoles arguments against emulation get even stupider. They don't infringe on copyright at all because you have to have the original game cd to play them, no downloading ROMS no problem, or at least you'd think. The fact is every console manufacturer loses money on every console they sell. They are heavily subsidised because they know they make the money back through the profit on the games. By emulating these cd/dvd based consoles your actually giving them more money because your still buying the game but you haven't bought the subsidised console. What the companies don't want to say is that if you have a PC and an emulator instead of their console it gives you freedom of choice so when two similar games come out on different consoles you can pick the best version. The companies depend on tying you financially to their console so you only by their games. Of course what makes this even worse is that we'll never get to the stage where we can have that choice on our PCs. Emulators are developed by groups of enthusiasts and it takes a lot of time. We are always one or two generations behind the console market (don't believe the rumors; there are no Dreamcast, PS2, X-box or Gamecube emulators yet) so there is even less for the companies to worry about. My belief is that computer and video games are art, and as such we have a right to be able to play them, not for free but at a reasonable price. It all comes down to history, when the last Asteroids arcade machine or Atari 2600 become broken beyond repair the ROMs and emulators we've collected will be the only record left of these classic games. We are not trying to bankrupt the games companies they are our friends, they make the wonderful games. We are just trying to preserve our gaming heritage. If you want to see the other side of the story read this. Legal - owning and emulator. Well there is still some dispute over this, and court cases have been won by Sony over Playstation emulators sold commercially but no freeware emulator that I know of has been touched. Illegal - owning a ROM image of the BIOS chip that the computer which you are emulating needs in order to run. The BIOS chip contains software which is covered by copyright. So for example you can have the UAE Amiga emulator but you can't have the kick.rom bios file that you need for UAE to run. Legal - owning an image file of a game or program that you already own in its original format - if that format is disk or tape. This is considered a backup. For example you can have a .tzx file of a Spectrum tape game if you own the original game. Illegal - owning an image of any ROM cartridge EVEN IF YOU OWN THE ORIGINAL GAME. Backups do not cover software stored on ROM chips. This effectively prohibits all rom based console and arcade emulation. Legal - Running a cd console game (eg Playstation) that you legally own on a PC with an emulator from the original cd. It's your cd you can do what you like with it! Illegal - Owning a pirate cd (duh! ).